Remember Fox Force Five, the unsuccessful TV show pilot Mia Wallace talks about in Pulp Fiction? Well, Uma Thurman is back in this new Tarantino release, not as a police chick expert in knives, but a katana-slashing killing machine seeking revenge on ex-colleagues of an organisation of female assassins. 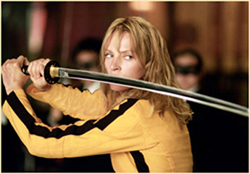 Uma Thurman is only known in this first installment as "The Bride", and her real name is not revealed. Its not that important anyway, since she is better known by the people she is hunting down on both sides of the Pacific ocean as "The Black Mamba", the deadliest of the Deadly Viper Assassination Squad. The film starts four years back, with The Bride getting an unexpected visit from her colleagues, her boss Bill (David Carradine) and his brother Budd (Michael Madsen) at her wedding ceremony. The Bride gets beaten nearly to death by her former squad, sees her ceremony end in bloodshed, and finally gets a bullet in the head after telling former lover Bill that he is the father of her pregnant girl. But those who betrayed her made the fatal mistake of not making sure the Black Mamba was dead and buried. Black Mamba awakes from a coma in a hospital room four years later, to discover that she has lost her baby. The storyline in this movie is full of suspense, but as in all Tarantino movies it consists of flashbacks and ellipses. The end as well is intentionally obvious: a kind of Tarantino way to answer the problem of having the good assassin live till her promise for revenge is fulfilled. You know Uma Thurman is going to get every single one of them until a still unknown climax, and that’s the point. Its not second-degree, its a Tarantino-degree movie. And it makes you want to see the second part even more. The photography is brilliant. A perfect format for Kill Bill would indeed be a comic or manga, and I’m sure we’ll see a few of those coming out pretty soon. After the first half-hour, those who could not take the constant outflows of blood pouring on the screen had all gone. Those who stayed watched till the end the Tarantino approach on the Art of kung fu movies and manga culture. Kill Bill is different from most films of the same category, in that it manages both to parody and to celebrate the genre. 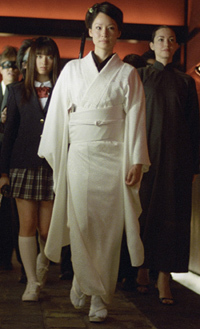 Tarantino switched from Pulp comics to Manga and anime, but in this fourth movie he has perfected his film-making techniques and explored new ones. The chapter about O Ren Ishii’s childhood (Lucy Liu) is entirely in anime produced in Japan, and includes all that could not be shown on film. The graphic and moral violence (tons of blood, pedophilia, etc.) are exaggerated, as it is part of manga storylines. The result is that the extreme violence of the movie is done more intelligibly than gratitiously, and is therefore not unbearable to watch. Kill Bill has not yet been released in Japan, China and Asia, but the film was made probably with a special mention to its future audience there. After all, Japan in particular is a country where manga magazines thick as a telephone book and printed on rough pulp paper, circulate in the tens of millions every week. Most characters are Japanese and Asian. The title itself, Kill Bill, sounds like a typical manga, and gives an excellent Japanese phonetic Kirubiru. Women killers is a whole movie genre in Japan, the famous yakuza no jousei movies of gangster ladies avenging their loved ones. Some characters are direct stereotypes of manga and anime icons, like the degenerate and sadistic schoolgirl Go-go Yubari, (played brilliantly by Kuriyama Chiriaki), a cross-section of shoujo girl comics and Sadako in The Ring (The original version, not the pathetic USA remake). I wasn’t always totally convinced by Uma Thurman’s acting in movies like Gattaca, but in both Pulp Fiction and Kill Bill, her performance matches perfectly her characters. Lucy Liu is excellent as a gorgeously psychopathic assassin- also head of the Tokyo yakuza council. Its a shame though that this actress is not given a wider range of characters other than this usual profile. Still, her "sinister black eyes" as The RZA puts it never cease to steal away the attention of the audience. In all Tarantino movies, music does a lot more than just accompany the action, it structures the way Tarantino wants us to watch his movies. And the Soundtrack must be heard for its own sake. In fact, the music was chosen by The RZA and Tarantino to encompass not only anime or kung fu movie soundtracks, but also spaghetti western movie melodies, such as Luis Bacalov’s the Grand Duel, which sounds as if it was taken directly from an Ennio Morricone tune. Both Far West and Samurai movies have always inspired each other a lot (Seven Samurai/ Seven Mercenaries, or Sergio Leone’s remake of Kurosawa’s Youjimbo, A Fistful of Dollars). But only Tarantino could have been ever able to bring Morricone, funky anime and samurai movie music together and make it sound so good, even when he takes the soundtrack of The Good, the Bad and the Ugly in the trailer for the second installment. Mixing elements of Asian and American popular culture, like the multiracial assassination squad, Chicks with Swords, yakuza and underground gangster movie themes, was a job for Tarantino. Most movies of the same kind are often really bad, but you forget that soon after watching Kill Bill. Part II in April 2004. Having seen both installments of "kill bill" and reading your article, I don’t think Tarantino created anything that was brilliant in this movie. Vol 1 was made with a storyline that was anime-ish, with some japanese animation and exaggerated violent martial arts theme; it was like a westernized version of an anime with the killer chicks and pervs, which are also some typical description of some anime characters. I think Tarantino is a copycat of popular japanese anime themes, because he knows that not many people out there are familiar with anime. So he created a westernized version of anime and presented his work which gained popularity in the west. Even movie critics cannot see that his work was not original and it was just a combination of things that have already been used in anime. Relating to your article, I perceive you come to dislike what tarantino in this movie as you mention about asian stereotypes that were used in the movie. We come to agree that hollywood deceives people with movies that have themes originally created from the east. I’m glad to see a writer who sees more than what other critics see from hollywood these days. What would be interesting would be to see the reaction amongst the Japanese and Chinese audience, amongst others, to this Hollywood production. But what I would still say about this Tarantino release is that it intentionally blows these Asian Kung fu stereotypes out of proportion, his usual angle, to make it his own. The damage would probably be indeed as you say in the general communication made about this movie in the West (Even more so in Europe I think), which seems to totally bypass what Tarantino wanted to present. Thanks for the message.